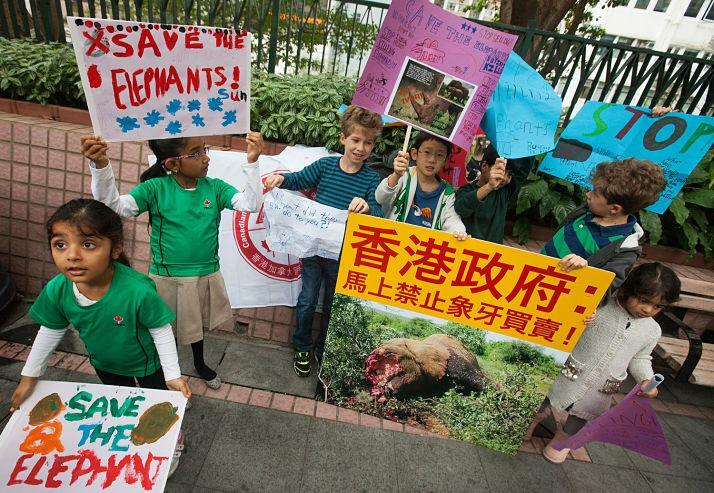 [caption id="attachment_7678" align="aligncenter" width="714"] Children and adults protest against Hong Kong's legal ivory trade in the city's ivory selling district of Hollywood Road and Queen's Road Central, Sheung Wan, Hong Kong, China, 14 March 2015. According to Kenya-based NGO 'Save the Elephants', 100,000 elephants were illegally-killed for their tusks from 2010 to 2012, a poaching crisis driven in large part by consumers in Hong Kong and China. [/caption] As elephant poaching crisis continues, over three-quarters of citizens living in key ivory market support a comprehensive ban on sales. 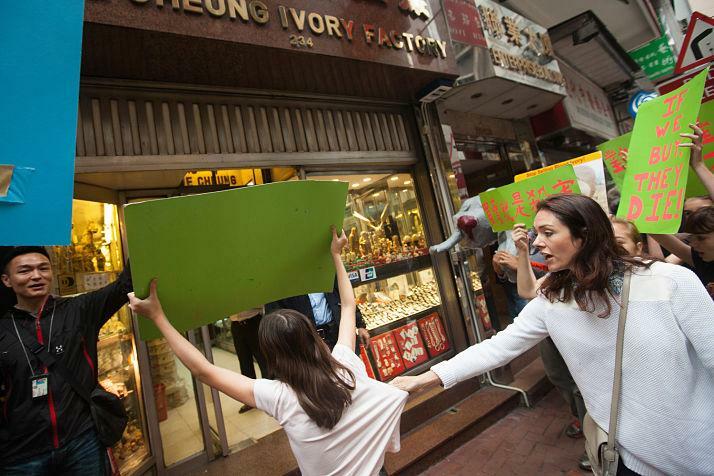 HONG KONG (26 May 2015) — The Hong Kong public overwhelmingly supports a comprehensive ban on elephant ivory sales, according to a new survey conducted by the University of Hong Kong’s Public Opinion Programme. 75% percent of the 1,021 respondents expressed support for outlawing ivory sales, which are currently poorly regulated in Hong Kong. Of those in favor, 55% “very much support” a ban, while 21% “quite support.” Additionally, three-quarters of respondents agreed that the Hong Kong government should stop issuing new ivory possession licenses. • Only 26% knew that ivory poaching is linked to militant groups and organized crime. The survey was commissioned by WildAid, Save the Elephants and African Wildlife Foundation, and is supported by Hong Kong lawmaker Elizabeth Quat of the Democratic Alliance for the Betterment and Progress of Hong Kong (DAB). (Click here to download the full report). 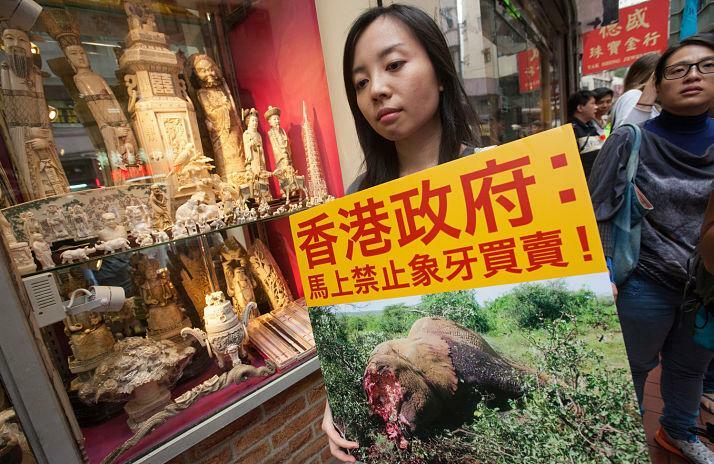 Chan Yung, a member of China's National People's Congress, said “At the Chinese Government's National People's Congress annual meeting in March, I felt honoured to submit a bill suggestion to the Standing Committee to ban China's legal trade in ivory. Now that this has been suggested, we are stepping up our efforts to lobby the Hong Kong government to ban the ivory trade in our city. Hong Kong's legal ivory trade masks a parallel trade in illegal ivory. This is aggravating Africa's efforts to stem wildlife poaching, harming China's international reputation and must be banned immediately”. 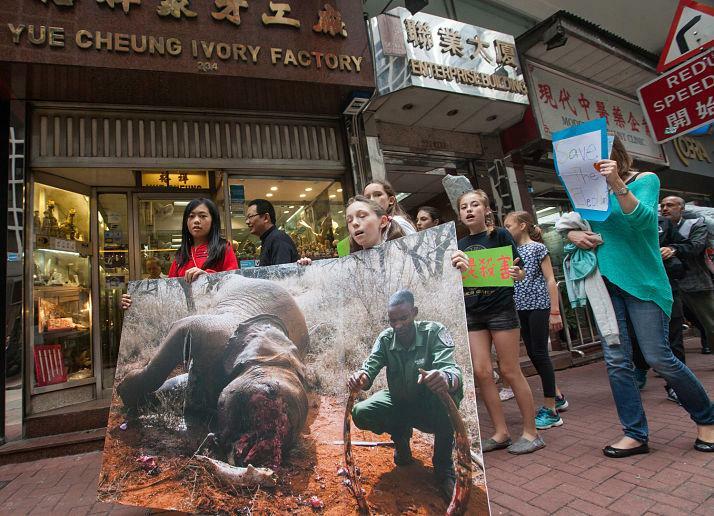 WildAid, African Wildlife Foundation and Save the Elephants are running a major public awareness campaign in mainland China to reduce the demand for ivory. The campaign uses public service announcements, billboards and subway ads featuring some of China’s biggest celebrities, including former NBA superstar Yao Ming, action hero Jackie Chan and top Chinese actress Li Bingbing, as well as The Duke of Cambridge (Prince William), David Beckham and others. In 2014, Hong Kong Lawmaker Elizabeth Quat was invited by all three NGOs to visit Kenya to experience elephant conservation efforts first hand. In March this year, Elizabeth Quat successfully persuaded 32 Hong Kong deputies to China's National People's Congress (NPC), many from the DAB, to submit to the Standing Committee of the NPC a bill suggestion proposed by Chan Yung陳勇to ban the domestic sale and transportation of elephant ivory in China. The 32 lawmakers who signed the bill suggestion to the NPC SC were; 陳勇 Chan Yung, 鄭耀棠Cheng Yiu-tong, 馬逢國 Ma Fung-kwok, 馬豪輝 Ma Ho-fai, 王庭聰 Wong Ting-chung, 王敏剛 Wong Man-kong, 盧瑞安 Lo Sui-on, 田北辰 Michael Tien, 劉佩瓊 Lau Pui-king, Priscilla, 李引泉 Li Yin-quan, 楊耀忠Yeung Yiu-chung, 吳亮星 Ng Leung-sing, 張鐵夫 Zhang Tie-fu, 陳智思 Bernard Charnwut Chan, 范徐麗泰 Rita Fan, 林順潮 Lam, Dennis Shun-chiu, 羅范椒芬 Fanny Law, 胡曉明 Herman Hu, 姚祖輝 Andrew Yao,黃友嘉 David Wong Yau-kar, 黃玉山 Wong Yuk-Shan, 雷添良 Tim Lui, 蔡素玉 Choy So-yuk, 蔡毅 Cai Yi, 廖長江 Martin Liao, 譚惠珠 Maria Tam, 吳秋北 Ng Chau-pei, 葉國謙 Ip Kwok-him, 顏寶玲 Ngan Po-ling,霍震寰 Ian Fok Tsun-wan, 劉健儀 Miriam Lau, and 陳振彬 Chan Chung-bun, Bunny. The Hong Kong government's inaction on the issue is perpetuating a modern-day elephant poaching crisis. Hong Kong's Secretary for the Environment KS Wong should legislate for a total ban on ivory sales in Hong Kong by setting a reasonable date for the city's ivory traders to finally dispose of their stocks – after which time no more ivory could legally be sold.